Standing Ice Cream Small - Vanilla... / p.o.s. 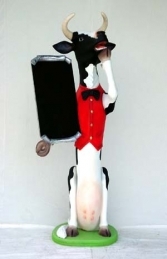 Attract maximum customer attention to your Ice cream kiosk, parlour or dairy with our 3ft free-standing single scoop pavement Ice cream statue, on waffle cone - VANILLA flavour. Here you have a standing ice cream on a waffle cone, single scoop vanilla flavour. Please note the ice cream is supplied on a weighted fibre glass base. The JollyRoger’s Ice cream point-of-sale models are fantastic promotional items to advertise your range of ice-creams to the public and are the best way to attract customers to your shop, kiosk or concession. The detail of our Ice-cream cone models makes them much more realistic than others on the market, they really do stand out. The ice cream looks mouth-wateringly realistic and will help generate extra sales for your business.